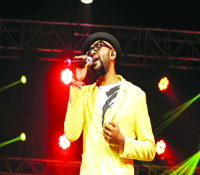 Travel does not deter singer Benny Dayal from giving interviews. In New York for the past few weeks, the singer is performing at different venues with his band, Funktuation, and is also writing songs. The 30-year-old prefers WhatsApp interviews these days. a�?I think it is cooler,a�? he sends a smiley. I begin by asking him about his new single, Aabhijaa, with city-based music composer Prithvi Chandrasekhar, scheduled to release this month. a�? Ita��s a simple yet soulful song. The song has evolved from what the initial idea was two years ago. It has come out really well,a�? texts the Mumbai-based singer. The college buddies have performed together several times in the past 12 years. According to Chandrasekhar, a�?The song has a newer sound, which is edgy. I would call it an electro pop song. It is a love-separation song. I am now working on the other songs in the album,a�? he says. Dayal has come a long way in the film industry. After constant struggle and getting rejected by established music composers, it was composer Pravin Mani from Chennai who taught him to sing professionally. However, it was the Madras Mozart, A R Rahman, who gave him his first break with Balleilakka in Sivaji, in 2007. After that there was no looking back for Dayal. a�?I am happy to have come so far. I look forward to climbing higher with patience and humility,a�? signs off the globe trotter.
? Inspiration: Nusrat Fateh Ali Khan, John Mayer, Michael Jackson ? Fashion: Linen shirts are the best. But I am more of a spur of the moment kind of a guy. ? Current crop of musicians: I think there is a new sound that comes out every day and there is a new energy. I think the youngsters these days are very bold.